[INQ. NO. 1312E34] DASAN Networks’ M2200 is a 1U height single-board mobile backhaul pre-service aggregation router optimized for expanding network. It provides one CIU (Clock Interface Unit) and four IU(Interface Unit) slots. Through the IUs, the user can configure the unit according to the network environment by using 100 / 1000 Base-X (SFP) , 10GbE (SFP+), 100 / 1000Base-T (RJ45) or TDM (RJ45), which can be used selectively as uplink or downlink. On the CIU slot, the module having SMA, TOD and BITS ports is mounted for clock synchronization. And the M2200 provides 2 PSU (Power Supply Unit) slots where DC or AC power module can be mounted. This ensures equipment-level reliability with power module redundancy architecture. [INQ. NO. 1312E31] DASAN Networks’ V8240 is a 7 RU height chassis-based G-PON OLT system which is comprised of 14slots for 10 service modular units, 2 uplink modularunits, 2 switching fabric units to deliver a wide range of full-featured and high-performance over FTTx applications. It is a high-density chassis system that supports up to 2,560 residential and business subscribers with 40 G-PON ports (1:64 split ratio). It also provides simultaneous services of G-PON and Gigabit Ethernet. 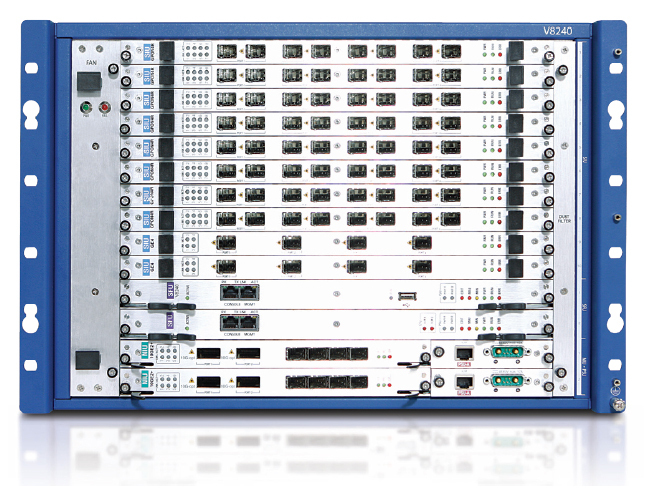 V8240 features flexible and high capacity G-PON access and 10GbE uplinks, scalability and line rate performance with a 296Gbps non-blocked switch fabric. V8240 guarantees equipment-level reliability with full redundancy design concept of SFU/Power/G-PON ports. This is a substantial factor for aggregation switches to perform continuous traffic forwarding to core network without failure. The PON technology adds new features and functionality targeted at improving performance and interoperability, and adds support for new applications, services, and deployment scenarios. [INQ. NO. 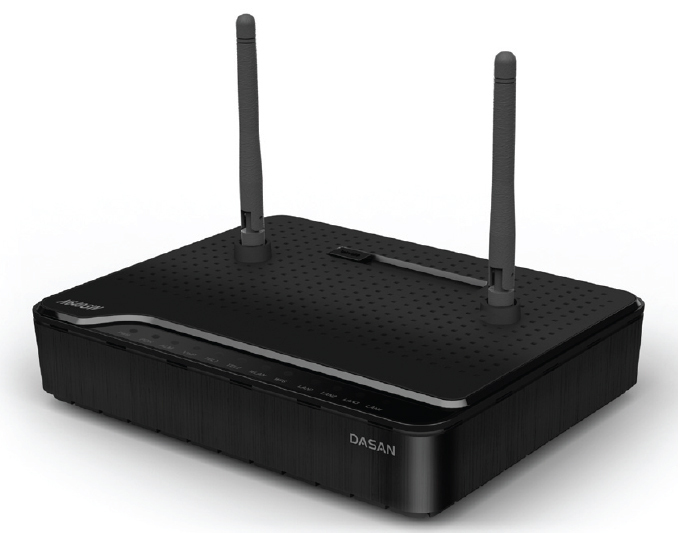 1312E30] DASAN Networks has opened up a new era in the broadband access network and offered the most innovative solutions to customers. This provider differentiates networking solution offerings based on its indepth consumer understanding with a strong focus on R&D activities. DASAN Networks FTTx Solutions are designed for service providers to deliver ideal bandwidth solution to fulfill customers’ growing demands. Customers will enjoy high bandwidth applications ranging from fast Internet access to interactive multimedia services, video on demand and voice communication through dedicated optical fiber infrastructure. While deriving their strength and stability from universally deployed and proven Ethernet technology, DASAN Networks products simplify and reduce the cost and maintenance challenges of existing FTTx technologies.